Modern travel usually comes with luggage limits, so women need to know how best to launder their clothes while they are away so that they can take care of the garments as well as be able to re-wear preferred items as desired. There are many different options for washing clothes and doing laundry while travelling, though most depend upon where you are and where you are staying. Doing laundry by hand, using laundry services, finding a dry cleaner, or scouting out a washer dryer at a local laundrette may all be possible options for laundering clothes while travelling. Washing laundry by hand is usually the preferred method for washing delicates like stockings, knickers and bras, but larger garments can also be hand washed as needed. Filling a sink or even a bathtub with tap water and using a small sachet of laundry detergent, or even a bar of soap in a pinch, can help get out everyday dirt and grime. However, doing laundry by hand is usually not powerful enough to remove larger or more intense stains. 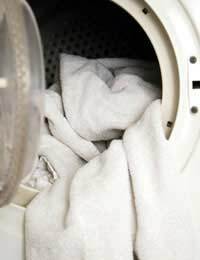 Try to avoid wringing clothes when washing by hand and do not lay clothes across heating units to dry. Instead, allow clothes to drip dry such as by hanging items from a shower curtain rod. Avoid hanging clothes that explicitly state 'lay flat to dry'. Depending upon your accommodation, there may be a laundry service open to you. Many hotels have an in-house laundry service that charges by the piece, though B&Bs, hostels and rented houses or apartments may also have laundry equipment that you can use (or have a member of staff use on your behalf). If you do choose to use such services, ask about prices before being surprised with a large fee and be sure to make any particular instructions clear before leaving your clothes in the hands of strangers. Also make sure you know how long the turn around for the service may be so that you don't end up needing an item, or needing to leave the premises, while your laundry is still being finished. Most major cities and quite a few suburbs have dry cleaners. You may find that in order to drop off your clothes you'll need to provide an address and phone number, so be sure to have this information on hand so that you are not turned away. Dry cleaners around the world tend to operate in the same way, though some dry cleaners may have a less expensive wash and press option for clothes that do not specifically need dry cleaning. Always find out about the cost of such services and how long such services will take before surrendering your clothes. Also be aware that most dry cleaners will not take responsibility for clothes that are damaged during cleaning. Again, most major cities and quite a few suburbs have laundrettes. These businesses provide customers with laundry equipment such as a washer dryer and sometimes even an iron and ironing board so that they can complete their own laundry. If you think you'd like to do your own laundry, look for a well-lit laundrette and try to avoid doing your laundry late at night when others will not be around. Also look for a laundrette that welcomes women and try not to leave your laundry before it is finished. Also, consider asking around to find out if there are any articles of clothing (such as women's underwear) that are not often found in public. Consider hand washing these items in private instead. Women's laundering options while travelling will be limited by location, but usually there will be at least one method by which women can clean their clothes. Packing hard-wearing, stain resistant clothing is always a good idea to help limit the amount of laundry, and energy needed to find laundry services, required on a particular trip.